It’s time to get into spring training! I’m sure you have all noticed that the sun has started to poke through the clouds more often in the last few weeks. That can only mean one thing; it’s time for spring training! If you’re one of those people who has hibernated over winter, don’t feel bad! Now is the perfect time to kick-start your training with a little dose of the sunshine and the great outdoors. 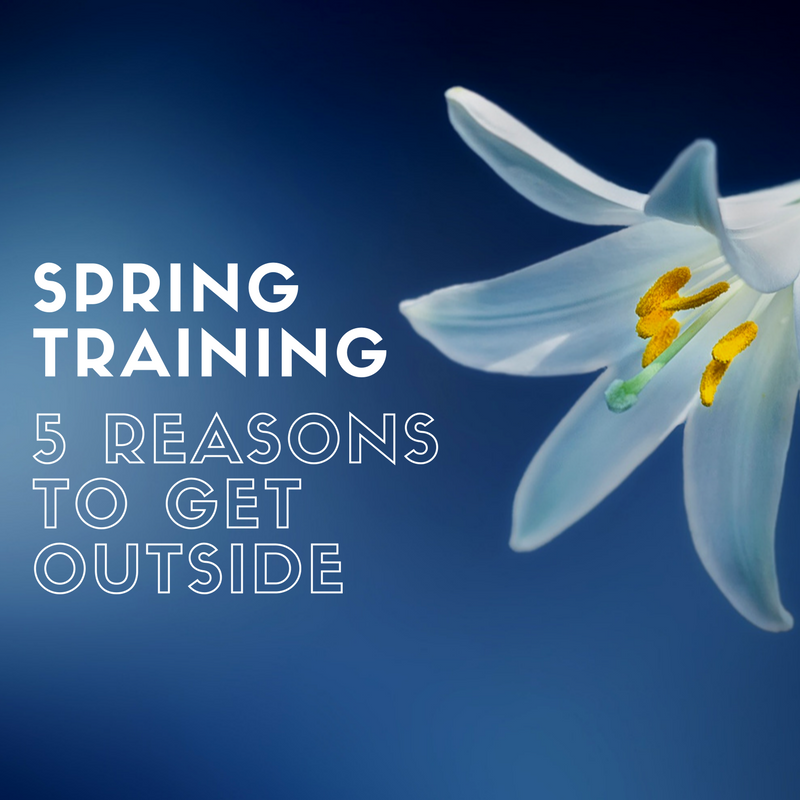 It’s time to trade your treadmill for trails and make the most of your spring training. In today’s blog, we give you 5 tips on how to adjust your training schedule to coincide with the new season. Even though it’s still running, running on a treadmill is different than running on an outdoor surface. Fitness consultant, Elizabeth Quinn explains that running on a treadmill is easier because there is a lack of wind resistance, terrain changes and treadmill belt helps propel you along with the moving belt. So before you start hitting the pavement, you may want to take it slow at first and get used to the change in terrain. You can also prepare for the outside on your treadmill too. In order to compensate for the treadmill’s momentum, if you raise the treadmill incline to at least 1% or more, you ultimately simulate the energy expenditure of walking or running on flat pavement outdoors. Even though the sun may be shining, you still need to wear appropriate gear to keep your body warm, we haven’t hit summer just yet! If you’re searching for the perfect spring training combination, the first bit of advice is that you will want to focus on layers. The first is your base layer. Number one rule, stay away from cotton. Cotton holds water and when you start to sweat in the cold, this can become an issue. Use a sweat-wicking fabric as your base layer and build on top of that. The next layer will depend on how cold it is outside. If it’s still a bit cold, you may opt for a fleece layer or a light waterproof jacket if the forecast is wet. Leading on from the last point, spring training is the perfect excuse to get yourself some new gear, especially speaking, running shoes! If you have been running throughout winter, you will most likely have had a shoe that is a bit wider with a deeper tread. Whilst this extra stability and grip are great for running in the wet, it can become a bit cumbersome when the weather gets a bit warmer. Go for something with a little more cushion, as you will be able to push yourself just a bit harder knowing that the terrain you are running on will be just a bit more forgiving. If you’re looking for a new pair of spring training running shoes, check out this article from Runners World that gives you 23 great options. With a new season comes the chance to reset, analyse and lay out some new goals for your spring training. Whether you have hit a plateau or are doing great, this is a great time to evaluate where you are and where you want to be. Remember business studies back in school when we were taught about SMART goals? This acronym certainly applies to spring training too. The warmer weather should allow pursuing these goals more aggressively so don’t be afraid to aim high! If you’ve been dormant in your cave over winter or are ramping up the intensity, you’re going to need to invest in the recovery side of your training as well. Tired muscles burn out quicker so make sure you are ready to rehab after your first few training sessions. We are talking foam roller, Epsom salts, ice packs and the works people! There’s nothing worse than getting motivated to start your spring training and suddenly go down with an injury that could have been prevented. This goes for proper warm ups too! Make sure you give yourself a period in which you can acclimatise yourself to the new season so you can hit your training hard. As precautionary and boring this may all sound, let’s not take away from the fact that we made it through winter! Spring is one of the best times to ramp your training routine and set yourself up for a great summer season. What do you love about spring training? Let us know by tweeting us @EtchRockUK!